Appeared in Issue No. 195 of the ADF Journal. Dr Anthony Cooper’s second book, Darwin Spitfires: the real battle for Australia, well-deservedly received the Northern Territory Chief Minister’s NT History Book Award. Kokoda Air Strikes: Allied Air Forces in New Guinea, 1942, his third book and second dealing with aspects of the RAAF’s air war in the Second World War, also deserves accolades. Here, Cooper casts a careful and occasionally—but understandably—cynical eye over the operations of the Allied air forces in the crucial New Guinea campaigns. He has taken on a formidable task. Rather than focus on specific topics, he offers a synopsis of existing Australian, Japanese and American research. Beginning with the conquest of Rabaul in January 1942, he presents the operations in the South West Pacific theatre—Coral Sea, Kokoda, Milne Bay and Guadalcanal—as a single air campaign. Importantly, he takes it further and discusses the battle for New Guinea as part of a broader, interconnected land, air and sea campaign with significant contributions by both the RAAF and American air forces. He confidently acknowledges that some of his conclusions may be open to challenge and welcomes stimulating discussion. In presenting a survey of significant operations within a campaign—and one of the best to my mind is the excellent ‘Losing Lae and Salamaua’ narrative—there is little place for individual stories. Indeed, the reader should not expect a human focus—the clue is in the title—and yet Cooper manages to include key vignettes which constantly reinforce the human cost of a campaign which had to contend with incomplete training, unsuitable aircraft and poorly set up and exposed airfields. The opening story highlights the inadequacies and the sterling bravery of the men who carried out their duty despite exhaustion, sickness, poor morale and the possibility of capture and murder. Often, Cooper employs just the lightest touch in the briefest mention of a personal tribute to spotlight the legacy of continuing losses, such as Medical Officer Deane-Butcher’s recovery of Sergeant Richard Granville’s body from wreckage, and the Australian flag, woven by the women of Itikinumu Plantation, placed on his coffin. Cooper presents a forthright and clearly articulated argument. If errors of judgment were made by commanders, he does not soft foot around them. He pulls no punches and thoroughly dissects their failures. This is a significant strength, as is his defence of commanders such as Lukis, Brett and Scanlon who have received unjust criticism by other commentators. As Cooper says, ‘Credit where credit’s due!’ and his reassessments are soundly based and utterly fair. Another highpoint is the selection of photos. The author’s obvious commitment to sourcing high-quality photos, regardless of the cost, pays off. Rather than relegating them to a glossy photo block, which limits the number of inclusions, photos are incorporated into the text, thus illustrating the story they belong to. The high-resolution Australian War Memorial images allow for this. Poor-quality personal album pics would not have worked in this reader-friendly approach. Complementing the 45 exceptionally well-chosen images are detailed captions which add more to the story and clearly demonstrate Cooper’s broad knowledge of every aspect of this campaign: men, machines, equipment and terrain. Indeed, the breadth of Cooper’s knowledge is impressive. He ranges from aircraft specifications and ensuing strengths and limitations, through to pilots’ living conditions and inadequate kit, to tactics and strategy, and high-level machinations and international relations. Happily, there is a good index and Cooper has not overlooked the fact that many readers want to springboard to further reading from authoritative accounts such as this. He has put glossary and extensive endnotes on his website . Maps and a formation summary, however, maintain their place in the book. 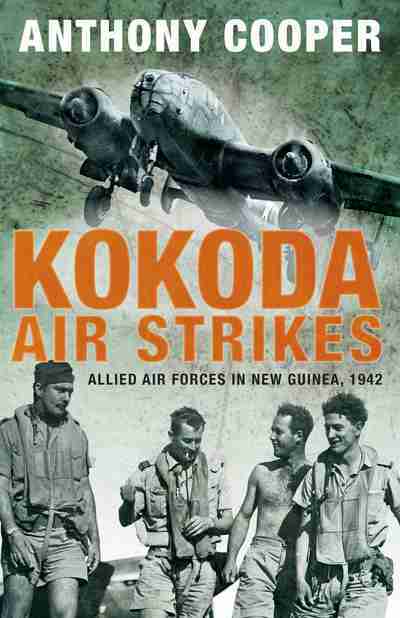 Kokoda Air Strikes: Allied Air Forces in New Guinea, 1942 is highly detailed, finely argued and a stimulating read. It canvasses the source material well and, with such well-reasoned analysis, may well be considered the new de facto official history of Australia’s part in the New Guinea air campaign. Highly recommended.